Don't get me wrong though, for a while there my painting sales were the most profitable part of my freelancing business over everything else I was doing including web design (I hadn't re-discovered animation at that point). 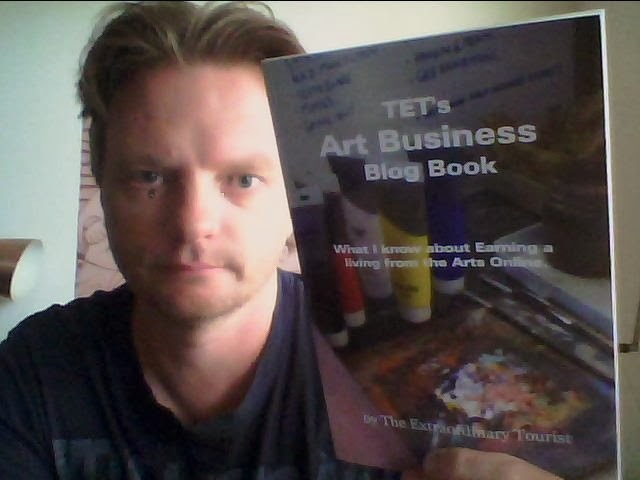 I've since deleted my Art Business Advice Blog, having not posted anything to it in over a year, however before I did that, I compiled the best articles into a book. Some of the articles will date, particularly some of the links and references to websites but the majority of it will hold true as worthwhile information to know if you're planning to sell your own art online. Although much of what I've learnt you can find from other sources the book differs in that you get my own personal experience of each issue. I'm not some academic, professional art dealer or gallery owner. I'm a real, largely unknown artist, who has successfully and consistently sold art online for a two year period... no gallery representation, just me selling my art. The book answers that age old question all new artists face - How do I price my Art? It does this by showing you a number of options and even includes a section just for digital artists. Other subjects include, how to promote your art, finding a market, creating a regular income with 'bread and butter' art, ways to sell your art online, photographing your art and more. There's also an entire series of articles outlining my personal experience with selling art on Ebay including a 'what not to do' case study of Ebay artist Marina Orlova - better known as YouTube celebrity, HotForWords - and why she can get away with doing all the things you shouldn't. Ultimately, the book reveals my business model and everything I've tried, to sell my art online. If it's in there I've probably tried it and you can get my personal opinion of the experience. The book is available as a 107 page, full color, soft cover edition. The cost of this version is unfortunately quite expensive (but the quality is great) so I've also made it available at a great price as a downloadable PDF book. For a preview of some of the content head over to the book section of this site. Seems a good book, even though it's not relevant to me. Can't it be sold on Amazon or even in Dymocks, though, I don't know how you go about that? I don't think your other book is on Amazon now in the Travel section, but I haven't looked for awhile. It showed a blank cover and I forget what it said about it now, but I think it said something wasn't available.